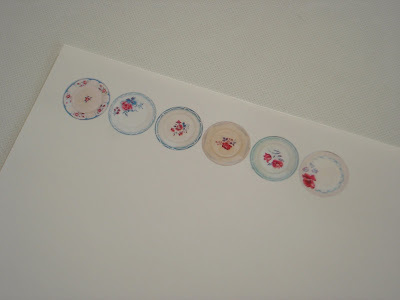 I have been thinking for some time about doing a tutorial to show you how I make the little plates you have seen on my blog and on Etsy. This is my first go at doing a tutorial, so please forgive any mistakes... also, if anyone can tell me how you get the photos to go bigger when you click on them, that would be greatly appreciated as I seem to have forgotten how to do it!! 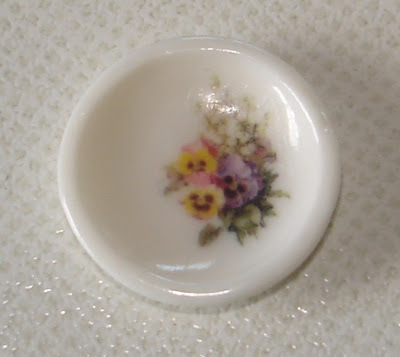 I make my little plates (and lots of other things) using waterslide decal paper. I bought it here. If you are in the UK you can also get it here. Unfortunately for me, it is extremely expensive to get it shipped half way round the world to New Zealand (it doubles the price!!!) but for you lucky people who don't live so far away, it won't be as expensive. You need to order the right decal paper for your printer....I have an injet. I use the clear waterslide decal paper. 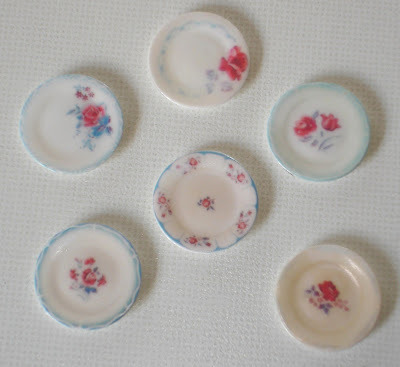 For this tutorial I will show you how to make a collection of shabby chic plates. 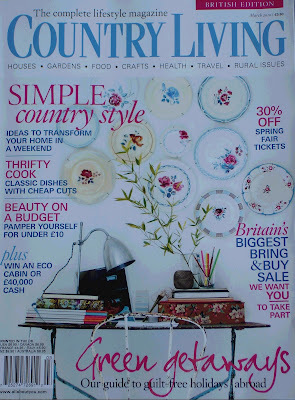 You need the images first of all - for these ones I bought a magazine with a wonderful plate display on the cover and photographed the cover to get images of the plates. 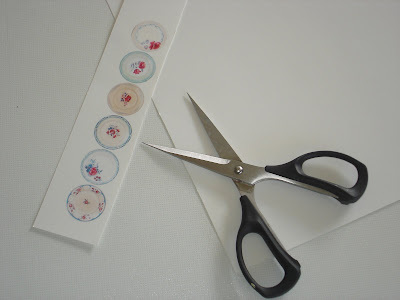 You will need to crop them down as tightly as possible so that you can later easily make them the correct size. I also photoshopped a few things out - I took out the visible edges of the plate hangers on these plates. However you get the images, you will need each individual image cropped right down to the edges. Then you need to accurately measure the diameter of the plates you will be using. The easiest surface to apply decals to is something smooth and flat....it is WAY WAY harder to apply the decals to cupped, curved and scallopped surfaces. 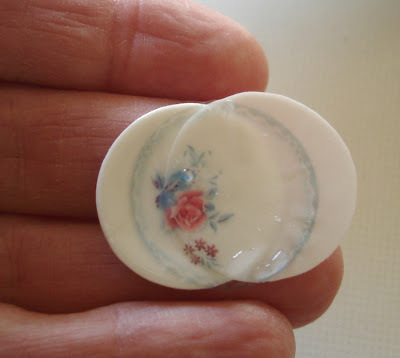 If you can find some nice, delicately made plates, you will end up with a nicer result than if you use something clunky. ...If you do this, then cut the printed part off the main sheet and save the main sheet for printing on again later. Once you are sure the ink is properly dry (oh, I am SO impatient!!! 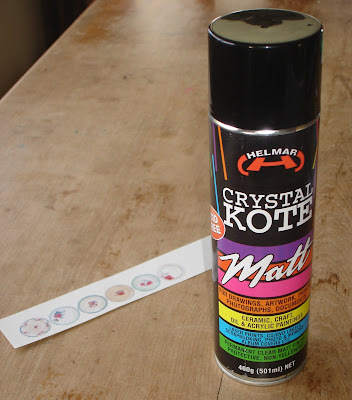 ), then you need to spray with a fixative. I use an acid-free matt fixative from an art supply shop. If you are buying your paper locally and don't have shipping issues, you could get the fixative from the same place you get your decal paper. Note: If you have a laser printer, apparently you can skip this step as the paper is already waterproof. Drop your decal into a shallow bowl of water. It will curl up and then a short while later will flatten out again. The decal will be loosening from the backing...don't leave it in there too long. When the decal has loosened from the backing, you can gently slide it onto the plate. Position it carefully, and then try to remove all water and air between the decal and the plate. I do this by pressing my thumb firmly down on the middle of the decal and then rolling it to the edges. It gets easier with practice....I've ruined plenty of decals - it certainly pays to have made spares! If you manage to get the decal positioned nicely and the air and water out from underneath, then that's fantastic - put it carefully aside and let it dry out properly.....it's pretty frustrating if you knock it crooked and ruin it at this point. The decals are a little bit forgiving, but lots of handling will just ruin them - they can fold on themselves or stretch if you mess around with them too much. You can, however, make small adjustments if they aren't quite straight. After they have properly dried, they are pretty permanent.... when I have tried to scrape them off it was easy as pie just after they are applied and nearly impossible a few days later. Here are the finished plates! 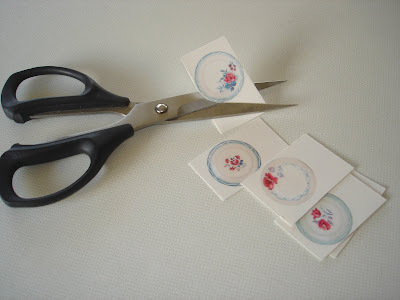 If you are making decals that don't cover the whole surface, like the little flower decal on the plate above, they are much easier to apply because you can just cut round the picture itself and don't need to be as accurate with positioning. The little logo on this mixer is a decal I made and added. I am a huge fan of these decals - I have made all the items in the above picture using them. 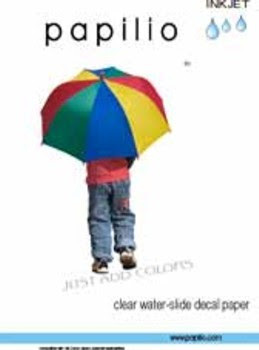 If you use the clear waterslide decal paper you need to be aware that anything in your decal image that is white will be colourless on the finished decal. So if you then apply it to something green, the green will show through instead of white. The decals are slightly transparent, so putting them on a surface that is any colour other than white will alter the other colours too. Therefore it is easier to use a white background. But you can apply them to many different surfaces - the toybox and kitchen board above are wood, the Chocolate Pot is porcelain, the cannisters are metal and the little shabby cannister with the pansies is painted resin. I hope you have enjoyed this tutorial....you are very welcome to contact me with any questions. Have fun with your decal making!!!! What a brilliant tutorial, Caroline :) I have been wanting to do for ages (and will still be wanting for ages as our printer is 'unwell')Even though I think I had worked it out, your clear instructions are a real help for when I get there. :) Thanks so much! I loved your tutorial! You did a great job writing it. The plates are adorable! Thank you!!! Carolyn!!!! You are such a DOLL for doing this!!! I am so happy! I just purchased some decal paper for myself a couple of weeks ago and needed to find out what I was going to do with it! I LOVE these plates so much!! I need to order the little white package of plates. Are they porcelain or plastic? oooooh, I am so excited!!! Thank you for sharing this! It's a very clever idea and a perfect tutorial! THank you Caroline, it's VERY useful! Thank you so much for this tutorial - I might have a go at these. Thanks for the tutorial Caroline. The instructions are clear and the photos are great. Terrific tutorial - and great to hear from someone else 'down under' too. ¡Gracias por el tutorial! A tí ya te queda muy bien. Si me atrevo te contaré mis resultados. Thank you so much, Carolyn. The fixative spray was the missing link for me. This is going to be great fun!! thank you so much for the tutorial, I will try to make it. Gracias Carolyn, el tutorial está muy bien explicado y los tresultados son fantásticos. Cuando lo intente te contaré. Con respecto a las fotos no te puedo ayudar, en mi blog si se amplían pero sinceramente no se como lo hice. Besos. merci , pour le fixateur , c'était aussi l'étape que je ne connaissais pas . Wonderful tutorial! Thank you so much for posting it! What a brilliant tutorial and very well explained. It's something I have never considered but will have a go at now. Thanks for sharing the info. Thank you for the tutorial. I'm just looking for plastic plates. Thank you for the tutorial, the result is really great. I may try it one day. Beautiful plates! Thank you for your guidance. Perfect tute Carolyn...didn't even know you could buy decal paper...I'm excited...and hubby is off to England soon, I'll be filling up his suitcase for the return journey, lol! 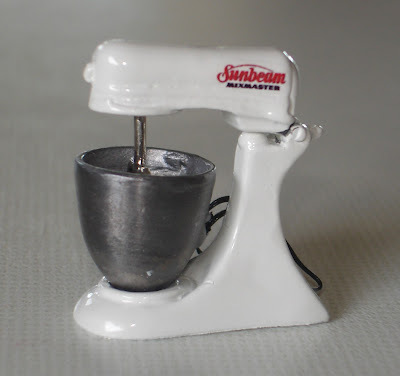 I love the miniatures that you have made! In Italy also we can find the decal paper. 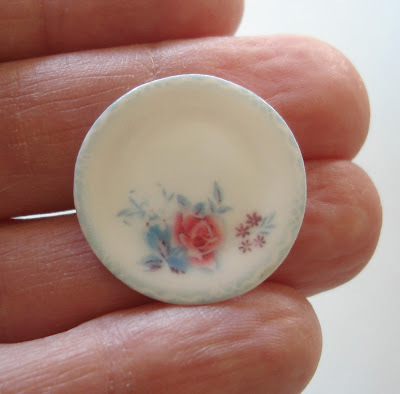 But I have not find beautiful flowers as on your plates! What a great tutorial...I would love to try this someday. The plates are so pretty. Thank you for this tutorial- it is excellent! I can't wait to experiment with this! Thank you, Carolyn. 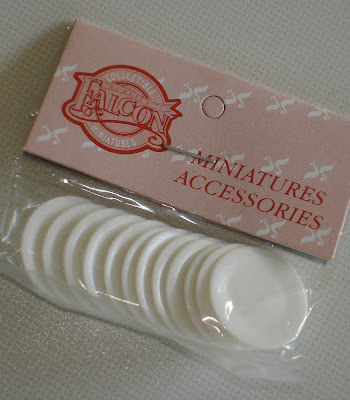 I have some decal paper but never thought of using it for minis...doh! Those are great!! I have never done that before! I looooooove the Scotty canisters!!! Thank you so, so much for sharing this with us, you're a true friend! I've just got to try some now. to make and it was very easy and fun. Your blog is very interesting, I have been charmed with it. Thank you very much for the tutorial. A greeting. This is a fabulous tutorial. Thank you for sharing it. How can I print it without printing the whole page? I tried doing copy and paste with no luck. Would it be possible for you to send it to me at my email? thank you so much for making this tutorial.Love youre plates and im looking forward to make my self some for the dollhouse. ¡¡Muchisimas gracias por el Tutorial !! y por tu gran generosidad !! You can add a comment on my Blog to answer. Thank you. 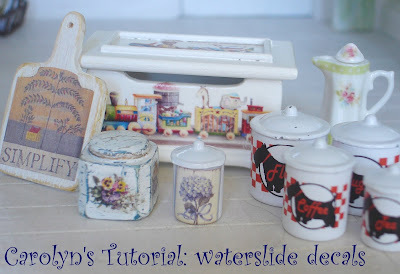 Once again Carolyn, I really love this tutorial! I have been wanting to try it for ages and bought the paper from England online but then realised I have no idea where to get the plates. Where did you get your ones from? Are they from N.Z. or did you order them from overseas? I hope you are okay? You haven't left a post for quite some time. I miss reading your blog. You inspired me to get in to minis. And introduced me to Shabby Chic. Thank you! I hope that everything is going well for you! I really appreciate your decals work for decorating plates as it is never easy to design and print by a single person. Cannot believe because the way you designed as it seems a work of professionals. The tutorial is so clear, I will try it soon. 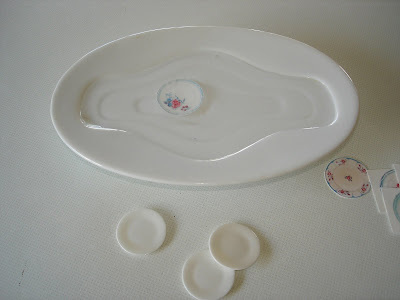 I just came across your little tutorial on making plates and I love them. I wondered if you could tell me where you get your plates? I am new to miniatures so don't know all the good online places. I have looked all over and I can't find anything that doesn't have the scalloped edged. Please let me know if you see this comment, thanks! Thanks for all the nice comments about this tutorial. I'm glad everyone has enjoyed it so much. Thank you for the tutorial on waterslide decal ( i know it is a very old post) but for me this art form is new and learnt a few useful things from your post. God bless and thanks once again.